Kruzh.com / Equipment for bobbin lace making / 1. Equipment and tools for bobbin lace making. 1. Equipment and tools for bobbin lace making. As far as basic ideas and definitions of lace making are reffered to in the next sections of the book, the first chapter contains brief information concerning lace techniques, threads, tools and equipment used by lace makers. An encyclopedical definition is known : “Lace is a net through fabric that consists of thread ornamental pattern interlacing (linen, cotton, wool, silk). There are laces that are embroidered by a needle, plated with bobbins, hook, knitting needle, shuttle and machine-maid”. No fabric can be compared with bobbin laces which have much more complex ornamental pattern, impress elegancy and airness in the best examples. Bobbin lace making is high skilled labour. It requires a plenty of time, concentration and perseverance. These are reasons to estimate laces highly. Besides one has to waste years to gain wide experience in lace making. 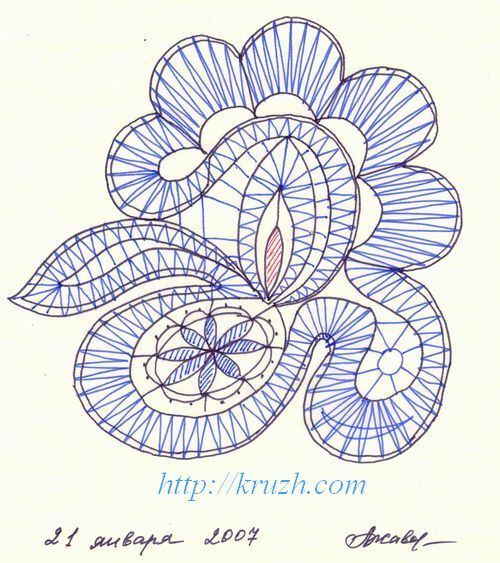 Teaching lace is prolonged multi-stage process conducted by a tutor who can open know-how including local, regional and personal secrets of lace making. 1. Coupling lace. A pattern is made with a little pairs of bobbins – from 6 to 12. A hook is used to link basic pattern and background net. 2. Twin (or multi-twin) lace. A basic pattern and lace background are plaited simultaniously. A lace consists of repeating motives. Amount of pairs depends of lace width and can reach dozens. Plaiting of unique laces (headscarvess, neckscarves) in the twin technique is the most laborous because require many hundreds of pairs. 3. Numeric lace. It is simple handsome lace plaited by a few pairs. It is known in Russia since the 15th centure. Numeric lace used to be plaited without a pattern, twisting threads by heart. Patterns passed from hand to hand. However since the second half of the 20th century prickings were used also in the numerical techiqees to save patterns and put mastery to many apprentices. An algorithm of bobbin lace making remains the same during centuries [1, 2, 4, 5, 6]. There are five basic stages of plaiting. Stage 1. A lace pattern is created at first (Fig.1.1). It has other name – a pricking. 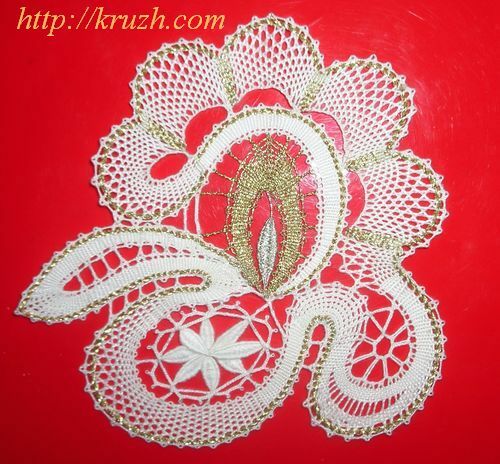 A pricking used to be a result of a complex process that requires skill, good taste, creative fantasy, know-how in details of lace techiques. Above all, a pattern is recognized in many countries as an object of author right nowadays. Stage 2. A pricking enforced by a cardboard or hard paper is set on a pillow by means of pins. Stage 3. The thread is wound on a bobbin tightly and regularly (two or more layers). Bobbins are always linked in pairs: the thread begins on the first bobbin and ends on the second one. Stage 4. Dozens of pins are pricked in the points of the lace pattern where plaiting is in progress. Pins are necessary to fasten threads forming the lace (Fig.1.2). As soon as the current lace fragment is plaited, pins are lifted and pricked into the next part of the pattern. Stage 5. Lace maker plaits an ornament according to the pattern holding several pairs of bobbins in each hand (Fig.1.3. This technique is called “cupped hand plating”. Deformations of lace pattern cannot be allowed. Some pecularities of lace technique depend on pattern’s structure. Multi-twin lace with regular structure that contains multiplicated fragments of a pattern is called “rhythmical” lace. Reiteration of pattern is named “rapport” (in French – repeating pattern of fabric, embroidery, wallpaper). 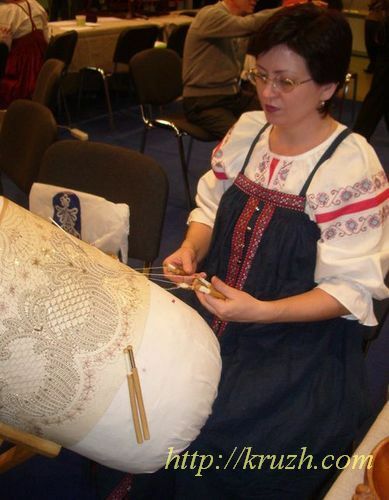 When rhythmical lace is being plaited lace maker rotates a bolster pillow “off herself”, lifts pins out of the plaited part of pricking and pushes them into the next part of pattern. Wide lace linen is being plated at all width of a pricking from top downwards. In link lace tecniques a bolster pillow is dealt with otherwise. As soon as a pricking is fastened on a pillow and plaiting direction changes, the pillow is to be turned periodically around one, two or three axes at some angle to pass from one to another part of the pattern. A plaitng is a long and protracted process. For the reason a lace maker is to keep thread and lace always clean. First of all one ought to keep clean hands and bobbins. Every plaited lace part is to be protected with a rag pricked with pins on the pilllow. To escape damage or dirtying all lace and pillow are to be covered with a piece of fabric cover-cloth at all interruption times. Finished lace needs no further processing and is ready to be used immediately if all techniques and cleannes measures are kept strictly. However in some Russian provinces ready laces are sometimes starched to toughen them.